Looks like Juliet Ibrahim and her new found boo, Iceberg Slim, are so in love, they couldn’t miss the opportunity to show the world, when they saw an opportunity to kiss on Live TV. During an interview on Ghana’s JoyNews on Friday, anchor Gifty Andoh-Appiah teased the couple who revealed that they met and fell in love during a trip to South Africa, to share a kiss and they did. Not once but twice! 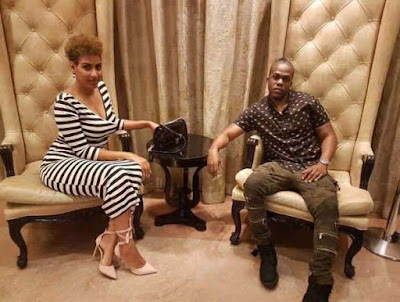 Giving viewers a gist of how their love journey started, Iceberg Slim, born Olusegun Olowokere, all blushing during the interview did reveal that they meet and fell in love when during a trip to South Africa. Their common was music! This, coupled with the fact that Iceberg Slim is also into music was enough to kick things.